The selection of woods that go into the making of a fine instrument is vitally important to its performance and beauty. Here, only the mature, seasoned woods of fine spruce and flamed maple are used, and only after they have been carefully studied for their grain pattern and consistency. 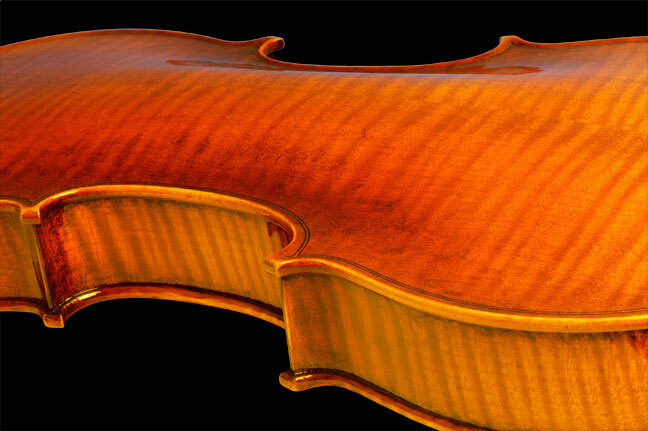 Considering the fittings, varnish, wood, outline of pattern and arching that must work together in a fine violin, wood, if not the most crucial element in the outcome of a violin, is certainly very near the top of the list. 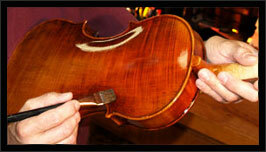 The finest Cremonese violins were made with Balkan maple and Northern Italian spruce. The Balkan maple has a high lateral strength with low weight or mass which imparts a broad low end to the voice. Northern Italian spruce also has a low weight yet has a seemingly dense cell structure that produces layered bell tones when tapped. When tapped, I assign a vowel to the bell tone ring and make note of the sustain and width of the ring. This directly correlates to the final outcome. A broad U or O vowel would be pared with a request of a warm dark voice. A tight E vowel would be pared with a request of a direct, brighter voice . In the early 1970's there was only a handful of active makers and fine aged European wood was available from repair men that had collected wood early in their careers but had long given up on the idea of making violins. Many had 20-75 year old wood which I acquired as some of the best in my collection. In 1980, just prior to Franz Kinberg's retirement, I bought 3/4 of the best wood that was in his stock. Up through 2000 I would add to my stack of spruce by acquiring Northern Italian spruce from a maker in Cremona. With thirty years of collecting wood, I am guaranteed a lifetime stock of supply of aged billets to select from. Not only is varnish responsible for the instruments appearance and protection, it must also contribute to its sound quality. 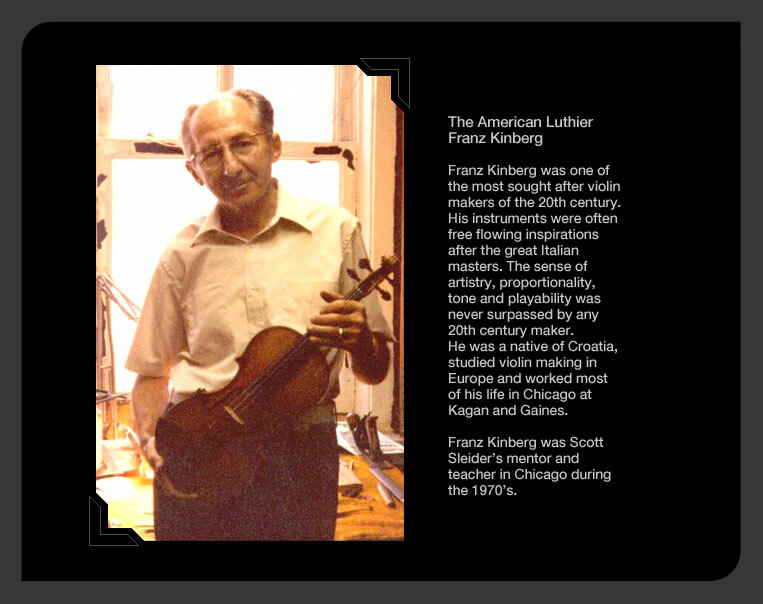 In 1973, Scott Sleider began experimenting with varnish resins and oil recipes from the era of Amati and Stradivarius (1550-1700), which are still commonly available today. For 35 years he has collaborated with other colleagues, makers and chemists, all who have these similar interests and who varnish two to four dozen instruments yearly. 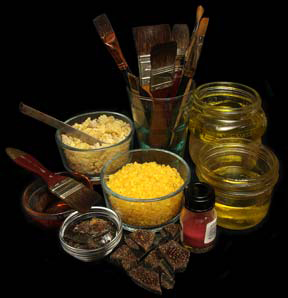 Over the years, test notes were recorded and gathered on how varnish played a role in the voice, how it affected the wear characteristics, visual effects, colorants and resins used on the violin wood. Also noted with the same interest was the initial treatment of the wood prior to the varnish being applied. All this collaboration led to the accumulation of many years of experience shared by each other, experience that involved lifetimes of data that each single maker could not have achieved alone. Today, Scott Sleider produces his own exceptional varnish that gives wood optically pleasing effects and is acoustically compatible with his methods of violin making. His signature varnish harmonizes visual beauty with enhanced voicing, forming an excellent varnish that will endure and be enjoyed for centuries.